NETWORK FINALS: The original SHARK TANK gained 0.1 in final numbers, but GRIMM lost the same. CABLE HIGHLIGHTS: It was all ESPN at the top of Friday cable, with a pair of NBA PLAYOFFS games at 1.24/0.95, and coverage of the NFL DRAFT at 1.00 on the mothership and 0.95 on ESPN2 (NFL Network’s coverage was at 0.56). Disney’s 9:30AM LION GUARD poked its paw into the Top 10 up 0.09 to 0.45. Discovery’s ALASKAN BUSH PEOPLE aired a 0.44 special, followed by TRAILBLAZERS at 0.22. NBC Sports Net’s coverage of the NHL PLAYOFFS was somewhat below basketball at 0.33/0.31. On HBO, REAL TIME WITH BILL MAHER dipped 0.04 to 0.25, and VICE was down 0.03 to 0.15. Lifetime’s ALASKA PLASTIC edged up 0.02 to 0.21. OWN’s FOR BETTER OR WORSE shed 0.02 to 0.21. 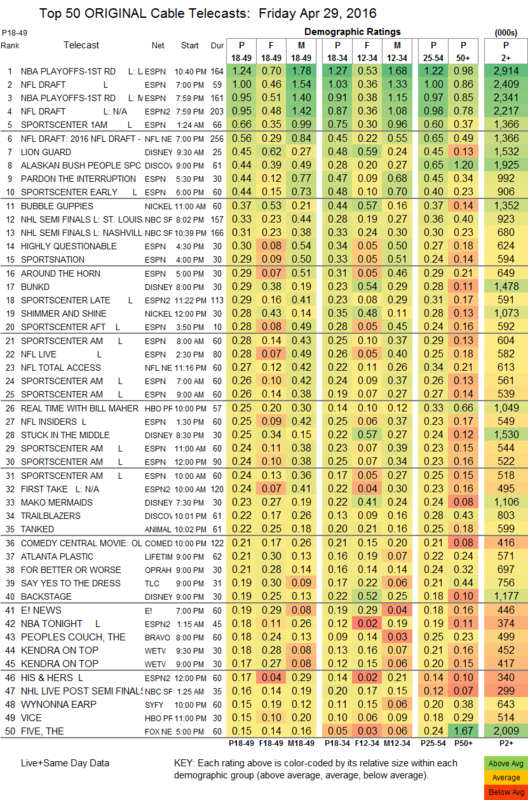 TLC’s SAY YES TO THE DRESS was up 0.02 to 0.19. Bravo’s THE PEOPLE’S COUCH gained 0.04 to 0.18. On We, KENDRA ON TOP was at 0.18/0.17, compared to 0.14/0.14 last week. 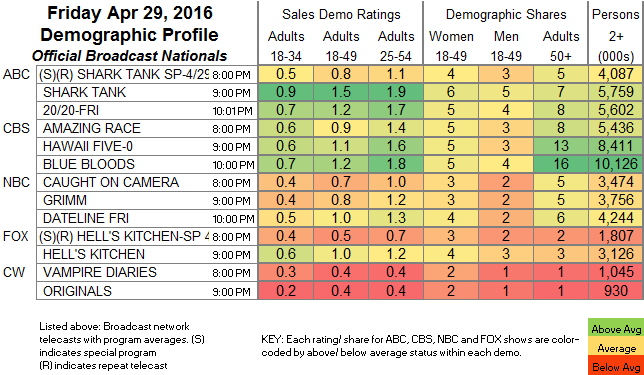 Syfy’s WYONNA EARP bounced back from last week’s low, up 0.07 to 0.15. Cinemax’s BANSHEE ticked down to 0.12.